Think being gluten free means you can't enjoy Thanksgiving? Miss the old days when you could gorge yourself on turkey, stuffing, cornbread, yeast rolls and some delicious pie for dessert? Thankfully Gluten Free will let you enjoy Thanksgiving again! 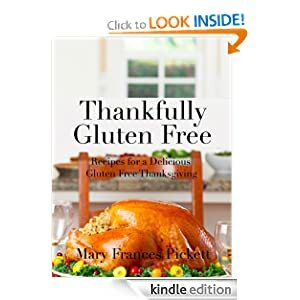 Written by Mary Frances Pickett, of Gluten Free Cooking School, Thankfully Gluten Free has every recipe you need to enjoy a delicious, fun, and happy Thanksgiving again. Includes recipes for the turkey, dressing, cornbread, yeast rolls, green bean casserole, pies, and more!